Everyone can feel better about themselves. It doesn’t matter if you are naturally a happy person or a normally depressed or angry person. I recently read an article by Jannice Vilhauer, Ph.D. in it she discussed a simple exercise she gives to her patience. This exercise is simple enough, but strangely, few people actually do it. I know that I tend to get into a rut of thinking. Sometimes the thinking is just that things won’t change and that I am powerless. So, regardless of what your negative thoughts are I think this could help. Keep a pad of paper next to your bed and every night before you go to sleep, write down three things you liked about yourself that day. In the morning, read the list before you get out of bed. 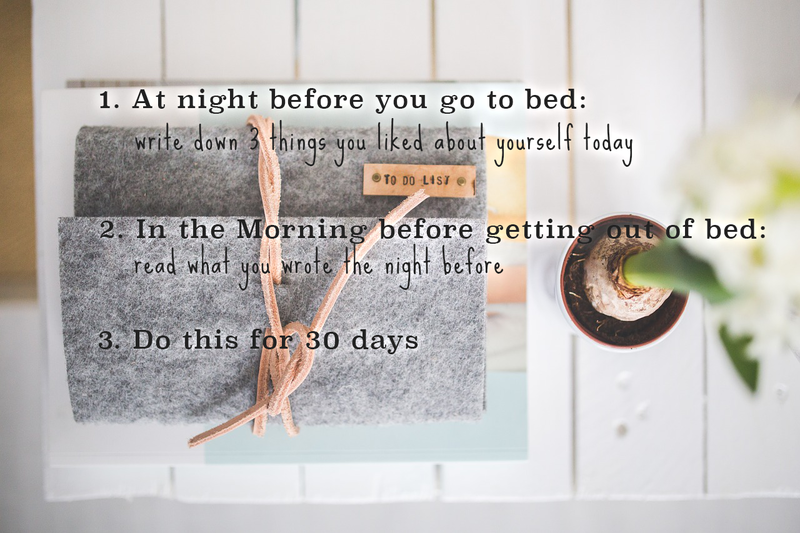 Do this everyday for 30 days. But remember: There is no benefit to your mental health in just understanding how the exercise works, just as there is no benefit to your physical health in knowing how to use a treadmill. The benefit comes from the doing. I’m interested to know how this works for you. I know I’m going to try it.